Owning a website is more than just having it built. Mr SEO’s suggestions for getting out of the sandbox faster. 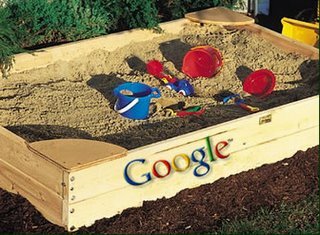 What is the Google sandbox?Some people may disagree that there is such a thing, but the Google sandbox does exist.. Here I will talk about what the Google sandbox is and ways to help avoid it, or, at the very least, shorten your time in it. What is the Google Sand box? The Google sandbox is a filter that appeared around March 2004. Your site may be indexed within a few weeks of submission, however, it may not rank for any keyterms for several months. This period of purgatory, if you will, is un-affectionately referred to as “the sandbox”. The reason for the delay is that Google is doing it’s best to make sure your site is not using any methods that they feel would constitute spamming. They want to be sure that your site is of a quality nature and useful for some purpose. Google may also use this time to see what you are doing in relation to your site. Are you adding content? What kind of content is it? Are you building backlinks? Are they one way or reciprocal? Who is linking to you and are they related to what your site is about? Let’s take a new build as an example. We register the domain then build the site and submit it to search engines and wait for it to be indexed. But…what if we wanted to speed the process up? How could we go about doing so? While our site is being built, we create and place 3- 6 pages of real content on the site. When I mean real, I mean readable content related to our site. No one will be visiting our site but we want the search engines to start indexing it site as soon as possible. For that to happen, we will need some content. We want to show the search engines that our site is about quality from the start. The design of the site should be a secondary concern and can always be tweaked later on. Google wants to know about what you have to offer them in terms of content, so let’s show them. While our site is waiting to be spidered, there are additional steps we can take. We can start working on backlinks. Link exchanges are alright in my book, but no substitute for links created through quality content. There are many reasons why articles about topics related to our business should be written and submitted, the least of which are the quality one way links they will create. Let’s say we write a few generalized articles about the types of products or services we will be selling on the site. Now we are one step ahead of the game. We have created articles that will help build backlinks and advertised our site as well. Another thing we can do is to plan our submission to Google right after a Page Rank update. Planning a time frame for our site’s indexing is important. Updates happen roughly every 3 months. We need to plan our site launch and indexing for the time immediately after an update. If we launch in the middle or towards the end of an update, we’ll miss out on any links we have worked on. It will be at least another 3 months before we can earn some PR, so we need to plan our site launch time wisely. Another thing we can do is to allow Google to find our site first. How do we go about doing this? If we can find a site with a decent PR (let’s say 4), that doesn’t have many links going out and get them to link to us once our domain is registered, Google will get to our content pages as fast as we can post them. My business partner and I recently created the site http://www.articleuniversity.com The domain was purchased and the site built in 2 weeks time. I linked from my blog to the new site and made sure we had content in place as soon as I set it up. After only a few weeks, it is ranking #50 for “free article submissions” on Google. Granted, all my pages aren’t indexed and I have a Page Rank of 0…but the point still stands. 2 Yanıt to "Ways to avoid or shorten your time in the Google Sandbox"
Your living space is not limited by the square footage of your house. known it was this easy you may have made this change sooner. a great deal more about the topic and will be coming back for more.